Want it by Wednesday 24th April? Order within 3 days, 8 hours, 38 minutes and choose Royal Mail 24 Hour Delivery at checkout. 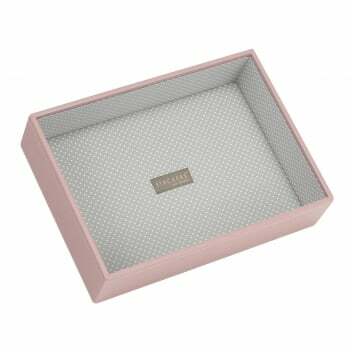 This soft pink stacker with grey polka dot lining is part of the classic collection and features a large deep open section which is ideal for storing watches, bangles and glasses perfectly. Leave it open, buy a wooden lid or place it under your soft pink lidded stacker for a pretty and practical jewellery storing solution.